I’m fortunate enough to eat at more wine dinners than makes healthy sense. Yes, that was your cue to whip up a tune on your world’s smallest violin (idea: someone should actually kickstart those). In contrast, you may notice I write very little about these dinners. Firstly, there’s the sheer ephemeral nature of the events, blinking in and out of existence like an electron. Secondly, many simply don’t live up to their potential; food may excel or perhaps the beverage in attendance is eminently drinkable, maybe even the theme and framework is particularly canny. Finding all those elements together is something of a holy grail, and as elusive as a higgs boson. Note: I love particle physics analogies, I’m like a very hungry Carl Sagan. This week’s Santa Giustina wine dinner at Pago was one event worth crowing about. 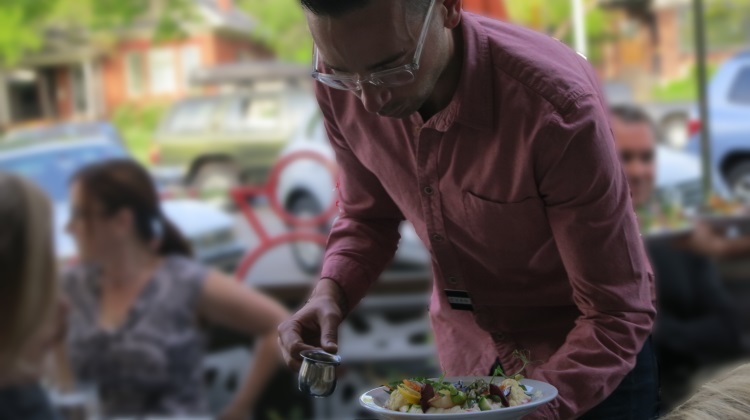 More importantly, as the opening dinner to their 2014 Summer Sommelier Series, you’ll have plenty of opportunities this summer to see why I’m so excited. As I’ve yammered on about before, these guys are creating some truly mesmerizing experiences right now, it almost makes me wonder if someone has signed a Robert Johnson-esque pact with the devil. First up there is owner Scott Evans, equal parts disarmingly humble and analytically smart. With a passion for wine, trained formally as a sommelier, his own path in the wine world took him into the restaurant business. I know I’m not the only one thankful for that. 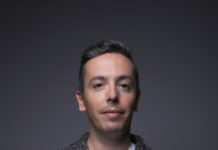 Pago came first, Finca followed and keep your eyes on the 9th and 9th area for his latest bar slash bites concept, slated to open in the summer. 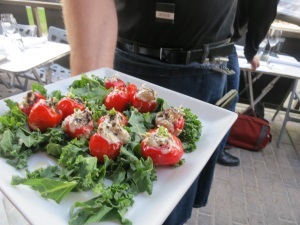 Add into the mix chef Phelix Gardner, whose cuisine seems to be getting better and better. Increasingly creative, with less focus on what’s trendy or buzzworthy, and more about “what do I want to stuff into my face the quickest”. Yes, that’s how I rate food. The final part of the trifecta is Pago sommelier – and wine maker in waiting – Evan Lewandowski. If you’ve ever withered under the scrutiny of a stiff shirted waiter or sommelier before – Lewandowski is the polar opposite; affable and knowledgeable and engaging. O.k. was that enough fawning praise? Good. I really can’t underscore Pago’s current magic enough. The Santa Giustina meal started with a passed appetizer (tuna nicoise stuffed pepper above), as guests arrived and mingled in the evening sun. The accompanying glass of Santa Giustina Ortrugo Vivace 2012 was sublime. A fresh and crisp wine brought to vivid life with naturally occurring effervescence from the fermentation process. Not a bubble in sight, but a pleasant tongue tingling finish. 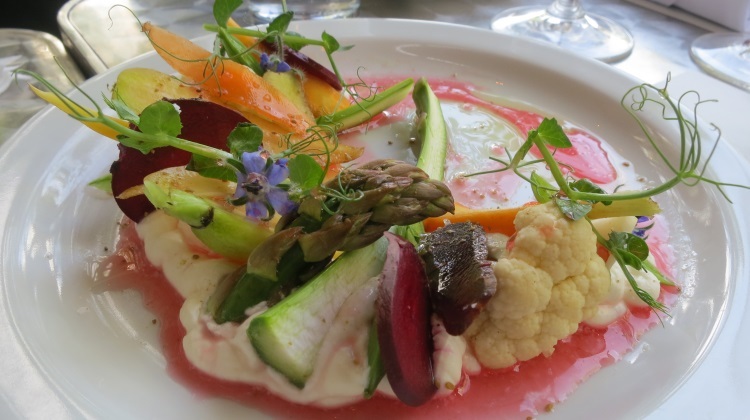 The only dish from the present Pago spring menu began the meal proper, a plate of spring farm vegetable crudite served with buttermilk ricotta and nasturtium vinaigrette poured table side by Lewandowski (pictured above). 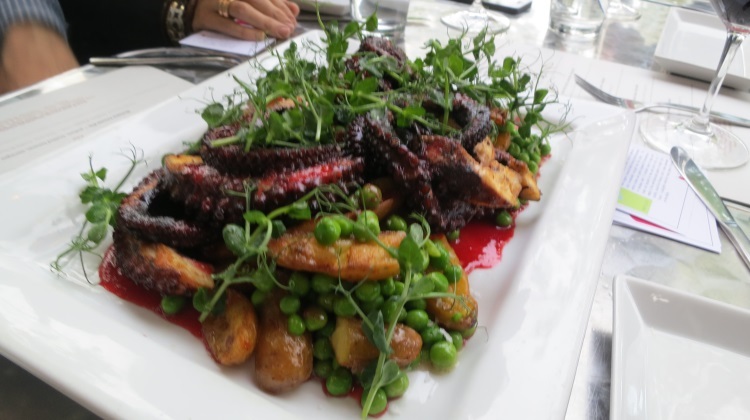 Next up a tray-full of Polpo Alla Griglia – octopus, smoked butter potatoes, peas and nanking cherry vinaigrette. Paired with another naturally ever-so-slighty fizzed red – Santa Giustina Bonarda 2011 – I could have greedily ploughed through the whole thing. If it weren’t for the fact these dinners are plated family style for the table, and the tiniest amount of decorum I have remaining, I would have done just that. 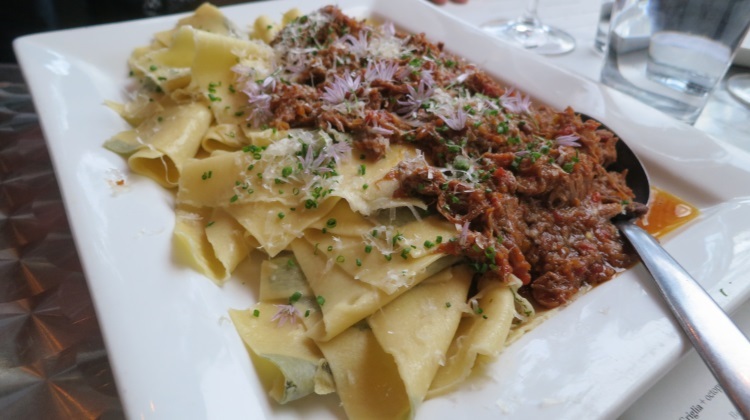 Next up was a heaped platter of hearty Morgan Vally Lamb Shoulder with red wine, natural sauce and a “mint pasta” that folded individual mint leaves into undulating ribbons of pasta. Mint, lamb, more red wine, a spring evening on a light-fading patio. You know what I mean. 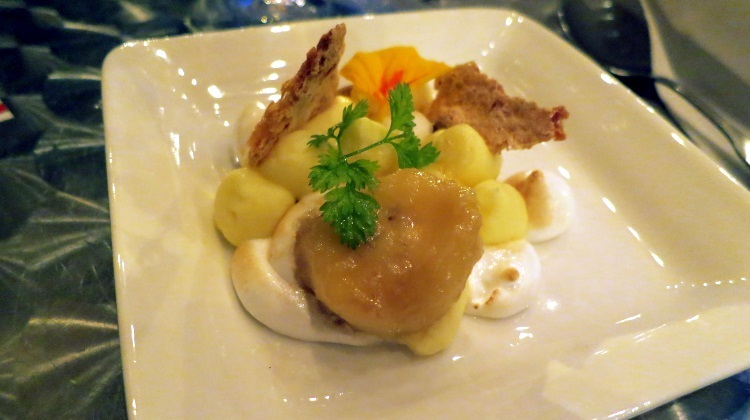 Dessert was Banana Cream Pie with graham cracker, bruleed bananas, meringue and paired with a Passito (Santa Giustina Stellato Passito 2009) – an Italian sweet wine, similar to ice wine. A not overtly sweet finish, to a rather sweet event. 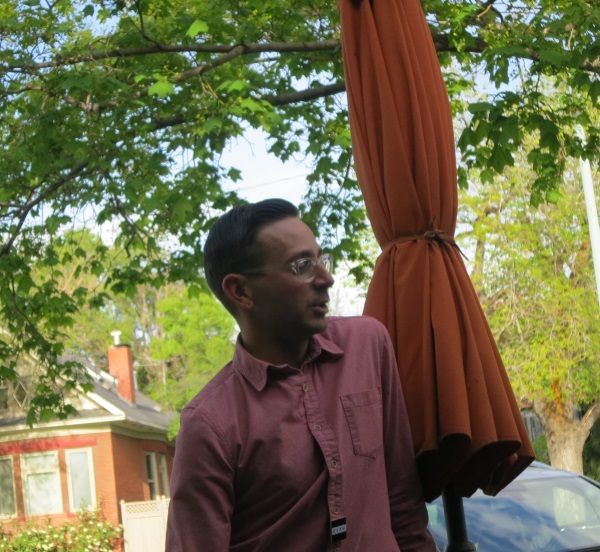 The evening event was held on Pago’s cheery patio, which can be a beautiful setting if the weather behaves itself – all sun dappled trees and light breezes. Plus, the odd passing roaring fire truck too, for dramatic interludes. P.s. its not just me, here’s what Mary Brown Malouf, one of my dining cohorts for the evening had to say.